Are you looking for someone to pollute your air and water? Send people to the hospital with horrific injuries? Abuse and kill animals in your backyard in the most merciless ways? Put plastic in your food? Look no further! Tyson Foods is coming to a town near you! Tyson, in partnership with Kansas Governor Sam Brownback and local officials, recently announced they’re opening a chicken poultry processing plant on a 223 acre site previously used to grow soybeans. The site will include a chicken hatchery, meatpacking plant, and 400 slaughter rooms capable of killing 1.2 million chickens per week. The location is in Tonganoxie, Kansas and the town’s residents are furious. Tyson’s arrival ensures residents a horrible and unhealthy smell in the air, toxic pollution in their water, low paying jobs, the brutal torture of defenseless animals, an influx of students into their schools, and a propaganda machine prepared to deny it all. More than 1,000 people gathered to protest Tyson’s arrival on Saturday. One protestor’s sign (pictured below) summed up the problem best. Appropriately code-named “Project Sunset,” the announcement has understandably been kept secret from residents until last week. Tyson’s reputation as the worst company in America? Not so much. 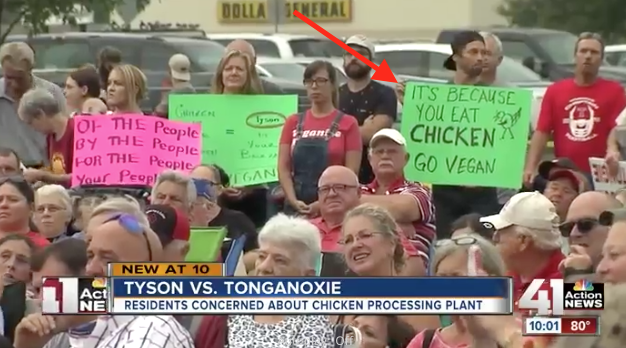 With Tyson’s sordid history of mistreating employees, beating up animals for fun, and wreaking havoc on the environment, who can blame Tonganoxie residents for not laying out the welcome matt. Even Erin Brockovich weighed in. Perhaps Tyson Foods CEO Tom Hayes will realize it’s time for Tyson to transition from animal to plant-based meat. It’s healthier, delicious, safer, popular, more humane, and sustainable. Kansas residents wouldn’t have the same negative reaction if Beyond Meat was opening in their hometown. It’s time for Tyson to make the switch to plant-based meat. Do you agree? 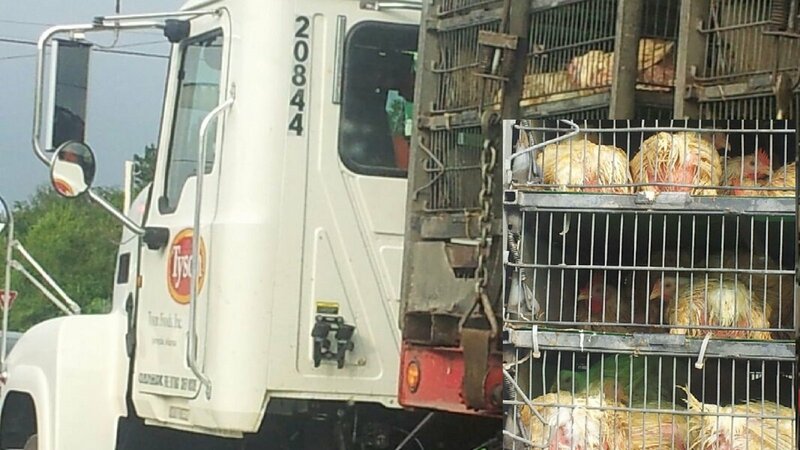 Tweet your thoughts to Tyson Foods. Terrible for the residents and the animals. I would have to move it they put a plant in my town.